Tickets vs. Lansdowne Bhoys FC are only $10 per ticket. Call the Coastal Credit Union North Carolina Football Club Box Office at 919-459-8144 or click here to buy tickets online. 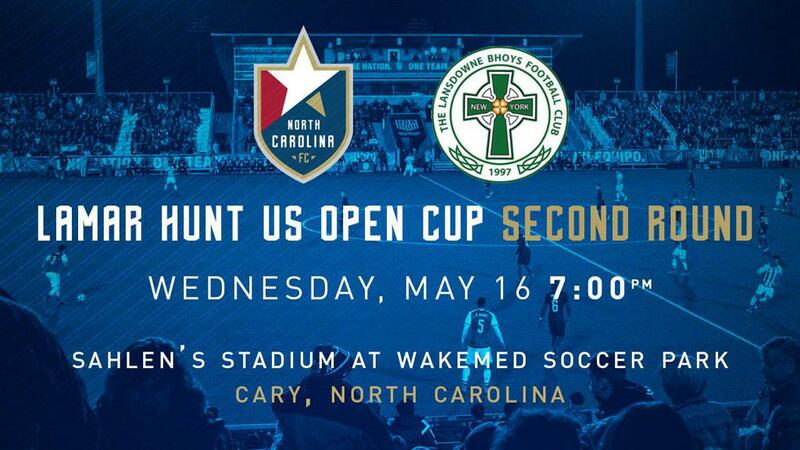 CARY, N.C. (May 14, 2018) – North Carolina FC’s 18-day break from action will conclude with the club’s second-round Lamar Hunt U.S. Open Cup matchup against Lansdowne Bhoys at Sahlen’s Stadium at WakeMed Soccer Park on Wednesday, May 16, at 7 p.m.
Over the years, NCFC has impressed in the Open Cup, reaching the semifinals of the competition in 2007 and the quarterfinals in 2013 and 2014. In its 10 appearances in the tournament, NCFC has beaten MLS sides six times. Here’s a closer look at Lansdowne Bhoys, NCFC’s first challenger in this year’s competition. Based in Yonkers, N.Y., Lansdowne has developed a reputation as one of the top amateur clubs in U.S. soccer. In 2016-17, Lansdowne impressively completed the amateur double, winning both the National Amateur Cup and the National Open Cup. Lansdowne captured the National Amateur Cup championship with a dramatic 3-2 (9-8 PKs) win over Bavarian SC and also claimed the National Open Cup title by defeating CD Montague 5-0. Lansdowne were founded in 1997 and have an established history as a successful club with Irish roots. The club’s current president, William McGrory, is a native of Donegal, Ireland, and head coach Austin Friel, a Derry, Ireland, native, starred the League of Ireland. Take one look at Lansdowne’s green and white striped kits and you’ll notice how it resembles the uniforms of Celtic, Scotland’s most successful team and a household name in Europe. As a young player, Sean Kelly stood out within Arsenal’s youth academy. A talented center back with a high soccer IQ, he captained Arsenal in the FA Youth Cup and played with Cesc Fabregas, one of the most accomplished players in English Premier League history. Through a series of unfortunate injuries, Kelly’s time with Arsenal came to an end, and he later played with Cork City and Pike Rovers in Ireland. Kelly’s life and career were transformed when he received a phone call from Lansdowne. The club offered him a chance to play and the opportunity for work in the construction business. Kelly now captains Lansdowne and, like many of the Lansdowne players, complicatedly balances work with soccer. Why? “Because I love it,” he said. Read more about Kelly and Lansdowne in this profile by Jonah Fontela. In addition to dominating amateur competitions, Lansdowne also held its own in its previous U.S. Open Cup appearance, too. In 2016, Lansdowne earned a first-round victory over the Long Island Rough Riders before pulling off an impressive 2-0 upset victory over the USL’s Pittsburgh Riverhounds in the second round. Lansdowne’s cup run eventually ended with a 2-0 defeat against the Rochester Rhinos. To earn the right to play NCFC on Wednesday, Lansdowne defeated the Brooklyn Italians 2-0 in the first round of this year’s competition. A first-half goal by Daryl Kavanagh gave Lansdowne an early 1-0 lead and that advantage was doubled in the second half thanks to a Brooklyn own goal. Lansdowne’s trip down to Cary for Wednesday’s match will mark the return to the Triangle for midfielder Lukas Zarges. Zarges, a Friedrichsdorf, Germany, native, played his final collegiate season at N.C. State in 2016, scoring three goals for the Wolfpack. Before his time at N.C. State, Zarges played at UNC-Greensboro for three seasons and was named First Team All-Southern Conference in 2014.